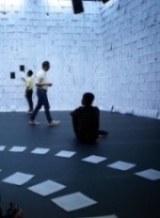 Ho Rui An is an artist and writer working in the intersections of contemporary art, cinema, performance and theory. He writes, talks and thinks around images, investigating their sites of emergence, transmission and disappearance within contemporary visual culture. He has presented projects at the 2nd Kochi-Muziris Biennale, TPAM Performing Arts Meeting in Yokohama, NUS Museum (Singapore), Serpentine Galleries (London), LUMA/Westbau (Zürich), Para Site (Hong Kong) and Witte de With (Rotterdam). He is the Singapore desk editor for ArtAsiaPacific and has contributed to numerous publications. He lives and works in Singapore. In 2016, he is an awardee of the Theaterformen Festival Grant reporting for Textures from the festival and the research atelier Our Common Futures. Last weekend the Festival Theaterformen ended after 11 vibrant days of performances, installations, talks and concerts, as well as our research atelier Our Common Futures. 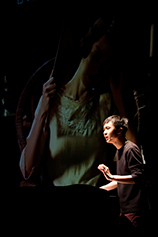 In this post Festival Grant Awardee Ho Rui An from Singapour shares his thoughts about two Malayan performances of the festival's first weekend.